Tobias Harris racks up a double-double with 20 points and 10 rebounds, Danilo Gallinari adds 19 points to lead the LA Clippers over the Sydney Kings, 110-91. Tyreke Evans scores 32 points with seven assists and seven rebounds as he leads the Grizzlies to a 109-99 victory over the Lakers. Jimmy Butler scores 23 points and Karl-Anthony Towns adds 21 as the Timberwolves get their first win on Christmas day by beating the Lakers, 121-104. Kevin Durant finishes with 33 points and Jordan Bell adds a double-double (20 points, 10 rebounds) as the Warriors defeat the Lakers 113-106. Andrew Bogut passes to Jordan Clarkson between his legs while setting the screen and Clarkson finishes with a hook shot in the paint. Harrison Barnes scores 21 points, Seth Curry adds 18 as Dallas wins it, 105-96. Goran Dragic scores 21 points with six assists, and Dion Waiters scores a team-high 29 points including a clutch three to give the Heat the win over the Cavs. •	Selected by Milwaukee in the first round of the 2005 NBA Draft (1st overall) and is the ninth player selected first overall to play for Golden State. •	Signed a contract extension with Milwaukee on July 11, 2008. •	Acquired by the Warriors along with Stephen Jackson in exchange for Kwame Brown, Monta Ellis and Ekpe Udoh on March 13, 2012. •	Signed contract extension with Golden State on October 25, 2013. •	Earned Third Team All-NBA honors in 2009-10, making him the first All-NBA center to play for the Warriors since Ralph Sampson in 1987. •	Was named to the NBA All-Defensive Second Team in 2014-15, joining Draymond Green (First Team) as the first Warriors to make an All-Defensive Team in the same season since 1975-76 (Phil Smith & Jamaal Wilkes, Second Team). •	Enters 2015-16 owning career averages of 10.9 points, 9.2 rebounds, 2.3 assists, 1.62 blocks and 30.4 minutes in 574 career regular- season games (564 starts) over 10 seasons with Milwaukee and Golden State. •	Has appeared in 36 playoff games (35 starts) with Milwaukee and Golden State, averaging 6.1 points, 8.8 rebounds, 2.1 assists and 1.31 blocks in 26.1 minutes, helping Golden State to the 2014-15 NBA championship. •	In Warriors playoff history, ranks first in field goal percentage (.570). •	Over 67 games (65 starts), averaged 6.3 points, 8.1 rebounds, 2.7 assists and 1.69 blocks in 23.6 minutes. •	Earned Second Team All-Defensive Honors, while Draymond Green earned First Team accolades--marking the first time the Warriors have had a pair of All-Defensive players in the same season since 1975-76, when Phil Smith and Jamaal Wilkes both earned a spot on the Second Team. •	Appeared in 67 games for the second consecutive season, his most games played since 2009-10 (69). •	Ranked second in Net Rating (16.6) and third in Defensive Rating (95.2). •	Recorded six double-doubles... When he grabbed 10-plus rebounds, Golden State was 20-0... Scored in double figures 12 times. •	Posted a 50-7 (.877) record as a starter along with Harrison Barnes, Stephen Curry, Draymond Green and Klay Thompson, comprising the team’s best five-man unit (min. 20 games) since the NBA began tracking starters in 1970-71 and the second-best starting five (min. 40 games) in NBA history, behind only the 1995-96 Chicago Bulls. •	Blocked a career-high nine shots on 4/7 at New Orleans, including seven in the first half, becoming the first Warrior to block nine shots in a game since Adonal Foyle on 2/21/03 and the first to do so while also scoring at least eight points since Manute Bol on 3/21/89. •	Recorded his 1,000th point and 100th steal as a Warrior on 3/20 vs. New Orleans. •	Scored a season-high 16 points on 3/2 at Brooklyn. •	Collected his 5,000th career rebound on 2/4 vs. Dallas. •	Returned to action on 1/7 vs. Indiana after missing 12 games with right knee chondromalacia/bone edema, the first time he came off the bench for the Warriors and his ninth career game as a reserve (first since 2009). •	Dished out a season-high seven assists (all in the first half) on 11/26 at Orlando. •	Grabbed a season-high 18 rebounds on 11/8 at Houston, tied for his second-most as a Warrior. •	In his 500th career NBA start (and 100th game with the Warriors), blocked four shots in 18 minutes on 10/29 at Sacramento, becoming the first Warrior to swat four shots in fewer than 20 minutes in a season opener since Manute Bol had four blocks in 17 minutes on 11/5/88 vs. Phoenix. •	Inactive 12 times with right knee chondromalacia/bone edema... Inactive twice for rest... Missed one game with the flu. •	Appeared in 19 postseason games (18 starts), averaging 4.7 points, 8.1 rebounds, 1.9 assists and 1.79 blocks in 23.2 minutes per game. •	Recorded two postseason double-doubles (five career). •	Blocked a playoff career-high five shots on 5/21 vs. Houston, becoming the first Warrior since Chris Mullin in 1989 to record five blocks in a playoff game... Tied a playoff career-high with 14 points and seven field goals in that contest. •	DNP-CD twice in the postseason. •	Appeared in 67 games (all starts), averaging 7.3 points, 10.0 rebounds, 1.7 assists and 1.81 blocks in 26.4 minutes. •	His 67 games were the most he’s appeared in since playing in 69 games for Milwaukee in 2009-10. •	Shot 62.7 percent from the field, becoming the first player in Warriors history to hit at least 60 percent from the field while averaging 10 rebounds per game. •	Among league leaders, ranked sixth in the NBA in blocks per game and tied for 10th in rebounding. •	Scored in double figures 19 times and had double-digit rebounds 36 times, recording 13 double-doubles. •	Tallied 16 points and 17 rebounds to go with five assists and three blocks on 1/31 at Utah, the first Warrior to post those numbers in a game since Chris Webber in 1994. •	Totaled 14 points and 17 rebounds to go with three blocks on 1/30 vs. the L.A. Clippers, becoming the first Warrior to post those numbers since Andris Biedrins in 2008. •	Grabbed at least 14 rebounds in four-straight games (1/28-2/4) for the first time in his career, becoming the first Warrior to do so since Andris Biedrins in 2008. •	Tied a career-high with seven blocks on 1/24 vs. Minnesota, the most by a Warrior since Andris Biedrins had seven on 1/18/10 vs. Chicago. •	Posted a 10-point/15-rebound/five-block game on 1/18 at New Orleans, the first by a Warrior since Andris Biedrins in 2008. •	Totaled 12 points and 20 rebounds on 12/21 vs. the Lakers, his ninth career 20-rebound game. •	Recorded a game-clinching block as time expired in a two-point win on 12/1 at Sacramento. •	Scored 17 points on 10/31 at the Clippers, his highest scoring game as a Warrior. •	Grabbed double-digit rebounds in a career-long 10-straight games from 12/7-12/25. •	Hit at least 50 percent of his shots in a career-best 26 consecutive games from 11/20-1/8, the longest such streak in 2013-14 and the longest by a Warrior since a 29-game streak by Andris Biedrins in 2008. •	Missed one game due to suspension (11/26)...Missed seven games due to left shoulder inflammation (2/6-2/22)...Missed one game with left ankle inflammation (3/18)...Missed four games with a pelvis/groin contusion (3/30-4/4)...Missed the final two games of the regular season (4/14-4/16) with a rib fracture that was suffered during game at Portland on 4/13. •	Missed all seven postseason games due to the rib fracture. •	Appeared in 32 games (all starts), averaging 5.8 points, 7.7 rebounds, 2.1 steals and 1.72 blocks in 24.6 minutes. •	Was one of five players in the NBA to average at least 2.0 assists and 1.50 blocks (along with Josh Smith, Joakim Noah, Marc Gasol and Tim Duncan) and just the sixth Warrior ever to do so (Ronny Turiaf, Chris Webber, Ralph Sampson, Joe Barry Carroll, Nate Thurmond). •	Had 11 rebounds and a season-high four steals on 3/8 vs. Houston, becoming the first Warriors center to record 10-plus rebounds and at least four steals in a game since Victor Alexander on 11/2/91 vs. Sacramento. •	Hit his second career three-pointer on 3/8 vs. Houston. •	Scored a season-high 14 points on 4/9 vs. Minnesota. •	Scored in double figures eight times and grabbed double-digit rebounds seven times, tallying one double-double (12 points and 12 rebounds on 3/17 at Houston). •	Made his Warriors debut on Opening Night, 10/31 at Phoenix, totaling eight points and six rebounds in 18 minutes, marking his first game action since 1/25/12 at Houston (with Milwaukee). •	Inactive 42 times due to left ankle rehab (11/3, 11/9-1/26, 1/29, 2/6, 2/9) and six times due to back spasms (2/22-3/2)... Missed two games (4/12-15) due to a left ankle bone bruise. •	Appeared in 12 playoff games (all starts), averaging 7.2 points, 10.9 rebounds, 1.8 assists and 1.50 blocks in 27.2 minutes while shooting 58.2 percent from the field. •	Became the first Warriors player to average double-digit rebounds in the postseason (min. five games) since Larry Smith in 1987 and the first-ever to average at least 10.0 rebounds and 1.50 blocks (blocks became an official stat in 1972-73). •	Also became the first Warrior since 1973 (Clyde Lee and Nate Thurmond) to post multiple games with at least 18 rebounds in a single postseason, doing so on 5/2 vs. Denver in the First Round and 5/12 vs. San Antonio in the Conference Semifinals. •	Tallied career-playoff-highs of 14 points and 21 rebounds on 5/2 vs. Denver, the first Warrior to reach those figures in the playoffs since Larry Smith had 16 points and 23 rebounds on 5/12/87 at the Lakers. •	Had three postseason double-doubles and grabbed 10-plus rebounds five times. •	Began season with Milwaukee before being traded to Golden State on 3/13/12. •	Appeared in 12 games with the Bucks, averaging 11.3 points, 8.3 rebounds, 2.6 assists and 2.00 blocks in 30.3 minutes. •	Fractured his left ankle on 1/25 at Houston and missed the last 52 games of the season following subsequent surgery...Had follow-up surgery on the ankle on 4/27 following trade to Golden State on 3/13/12. •	Missed four games due to personal reasons (1/3-1/8) and one due to concussion-like symptoms (1/13). •	Recorded three double-doubles and one 20/10 game (20 points, 11 rebounds on 1/6 at Philadelphia)...Tallied 10-plus points nine times, 20-plus points once and 10-plus rebounds four times. •	Blocked three-plus shots in six of his 12 games. •	Appeared in 65 games (all starts), averaging 12.8 points, a career-high 11.1 rebounds, 2.0 assists and a league-leading 2.58 blocks in 35.3 minutes. •	Scored a career-high 32 points on 1/26 at Dallas. •	Recorded 20-plus points nine times and 20-plus rebounds three times. •	Tied a career-high seven blocks on three occasions, which tied OKC’s Serge Ibaka for the most seven-plus block games on the year. •	Grabbed a career-high 27 rebounds, including 20 defensive rebounds, on 1/7 vs. Miami, matching Kareem Abdul-Jabbar’s franchise record for defensive boards. •	Appeared in 69 games (all starts), averaging a career-high and team-best 15.9 points to go with a team-high 10.2 rebounds and 2.54 blocks (2nd in the NBA) in 32.3 minutes before suffering a dislocated right elbow, sprained right wrist and broken right hand, ending his season and causing him to miss the playoffs. •	Earned All-NBA Third Team honors, becoming first Australian player to receive All-NBA honors. •	One of two players (along with Dwight Howard) to average at least 15.0 points, 10.0 rebounds and 2.00 blocks. •	His 175 blocks were the most by a Bucks player since Alton Lister (177) in 1982-83. •	Had his third career 20/20 game with 24 points and a season-high 20 rebounds on 2/22 at New York. •	Earned Eastern Conference Player of the Week honors on 3/15. •	Missed 13 games due to injury, including six games with a lower left leg strain/contusion, one with a mid-back strain and the final six with a dislocated right elbow, sprained right wrist and broken right hand. •	Appeared in 36 games (33 starts), averaging 11.7 points, 10.3 rebounds, 2.0 assists and 1.03 blocks while shooting a career-high 57.7 percent from the field. •	Missed 43 games, including the final 31, with an injured lower back and missed three games with a bone bruise in his left knee. •	Had four 20-plus point games, two 20-plus rebound games and a team-high 16 double-doubles. •	Appeared in 78 games (all starts), averaging then-career-highs in points (14.3), rebounds (9.8) and blocks (1.73), ranking 9th in the NBA in blocks and tied for 11th in rebounds. •	Secured a team-high 38 double-doubles, including 14 20-point/10-rebound games. •	Scored a then-career-high 29 points on 14-of-16 from the field to go with 11 rebounds on 1/12 at Phoenix. •	Appeared in 66 games (all starts), averaging 12.3 points, a team-high 8.8 rebounds and 3.0 assists in 34.2 minutes while shooting 55.3 percent from the field (8th in the NBA). •	Led the Bucks with 19 double-doubles. •	Tallied his first career 20/20 game with 20 points and 24 rebounds on 1/12 at Philadelphia. •	Dished out a career-best eight assists on 3/12 vs. Toronto. •	Participated in the Rookie/Sophomore Challenge as part of NBA All-Star Weekend. •	Saw a streak of 148 consecutive games played snapped when he missed the final 16 games with a left mid-foot sprain. •	Appeared in all 82 games for the Bucks (77 starts), averaging 9.4 points, 7.0 rebounds and 2.3 assists in 28.6 minutes, while shooting 53.3 percent from the field (5th in the NBA). •	Earned All-Rookie First Team honors after leading all rookies in rebounds, blocks (0.83) and field goal percentage while ranking fifth in points and seventh in assists. •	Started the Rookie/Sophomore Challenge as part of NBA All-Star Weekend, tallying 14 points and 11 rebounds in 16 minutes as a starter. •	Named NBA Rookie of the Month for January. •	Blocked a last-second shot attempt by Jason Terry to secure a 113-111 overtime win over Dallas on 11/29. •	Hit a game-winner with 0.7 seconds left in a 109-107 overtime victory over San Antonio on 12/20. •	Had 13 points and nine rebounds in his NBA debut on 11/1 vs. Philadelphia. •	Recorded his first career double-double in his second game as a pro, tallying 11 points and 17 rebounds on 11/2 at New Jersey. •	Started all five playoff games against Detroit, averaging 8.6 points, 6.2 rebounds and 3.4 assists in 34.4 minutes. •	Consensus National Player of the Year as a sophomore in 2004-05, won the Wooden, Naismith, Associated Press, USBWA, NABC, Basketball Times, ESPN.com and Sports Illustrated Player of the Year honors and was the leading vote-getter as an Associated Press First Team All-American. •	Ranked 19th in the nation in scoring (20.4 points) and second in rebounds (12.2) in 2004-05, leading the NCAA with 26 double-doubles. •	Led Utah to the 2005 NCAA Tournament Sweet 16. •	Named Mountain West Conference Player of the Year as a sophomore in 2004-05. •	Earned Mountain West Freshman of the Year honors and was a Second Team All-Conference selection as a freshman in 2003-04, averaging 12.5 points and 9.9 rebounds (15th in the nation) while hitting 57.7 percent of his shots (21st). •	Broke the Mountain West record with 14 double-doubles in 2003-04 (previously held by Tom Bellairs of Air Force in 1999-2000). •	His #4 jersey was retired by the school on February 18, 2006. •	Helped Australia earn its 12th-straight Olympic berth by winning the 2015 FIBA Oceania championship, where he averaged 7.0 points, 7.0 rebounds and 2.00 blocks in 20.8 minutes over two games against New Zealand. 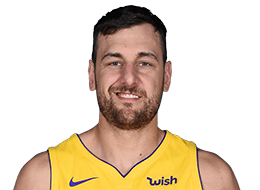 •	Played in the 2008 Beijing Olympics with the Australian National Team, averaging 12.7 points, 3.8 rebounds and 19.7 minutes in six games while shooting 59.6 percent for the Boomers. •	Helped the Boomers go 3-2 in preliminary play before falling to eventual Olympic champions Team USA in the quarterfinals. •	In the 2006 FIBA World Championships, averaged 12.8 points, 6.2 rebounds and 2.3 assists in six games to help Australia reach the round of 16. •	Played in the 2004 Olympics in Greece, averaging 13.7 points and 9.0 rebounds in six contests. •	In 12 career Olympic contests, holds averages of 13.2 points and 6.4 rebounds. •	Was a member of the U-19 Australian National Team. •	Named the MVP of the 2003 FIBA Junior World Championships in Greece after leading the Aussies to the title, averaging 26.3 points, 17.0 rebounds, 2.5 assists and 1.5 blocks in eight games. •	Prepped at the Australian Institute of Sport, which toured the USA in November of 2001 and 2002. PERSONAL: Son of Michael and Anne Bogut...Is of Croatian descent...Nicknames are “Bogues,” “Drew” and “AB”...Loves soccer, Australian Rules Football and tennis...Has two Siberian Huskies...Has been an active participant in Warriors community outreach programs since joining the team...Last season, was the top finisher from the team at the Warriors Foundation’s inaugural charity poker tournament...A noted car enthusiast, made an appearance at the San Francisco International Auto Show in 2012...Spoke to a group of high school students at Warriors HQ as part of the team’s future leaders program...During his first season with the club, made an appearance at a session of Warriors Basketball Camp, took part in several Season Ticket Holder events and made an in-store appearance in conjunction with Warriors Gold Alliance corporate partner Jawbone...In October of 2012, the Oakland Zoo named a wallaroo joey “Bogut” in his honor as both hail from Australia...Favorite foods are soup with noklice (semolina dumplings), cevapi (small grilled rolls of minced meat), burek (a pastry filled with meat, cheese or vegetables) and mum’s chicken schnitzel and potatoes...Claims he’s “very sarcastic”...In his spare time, enjoys listening to music, going for drives, going for coffee, surfing the internet, playing billiards, watching DVDs, playing any sorts of cards and playing with his dogs...Would have loved to have met Drazen Petrovic, the legendary Croatian basketball player...Usually eats pasta or rice before a game...Is on Twitter @AndrewBogut.